Steve Wozniak will be taking a break from Segway Polo and dancing the tango to be interviewed on radio program “The American Entrepreneur” Tuesday, June 15. Tune in from 3 PM – 6 PM (EST) online and call 412-333-1360 to ask Woz your most pressing Apple questions. Host Ron Morris will be chatting to Apple’s other Steve about his personal history, the early days of Apple, what he is up to nowadays and what Steve thinks of the evolution of the computer industry since he and Steve Jobs launched their fledgling startup in April 1976. 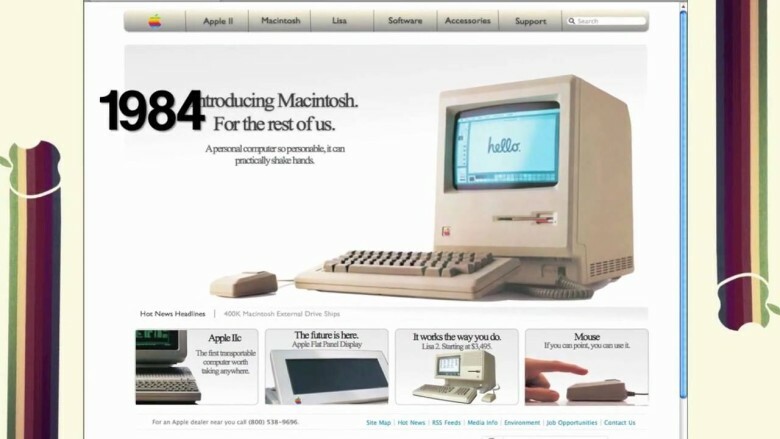 Matt, whose website describes him as a “normal dude that likes to talk about Apple and technology in general,” made this “what-if” trip down memory lane — an alternate reality version of what the Apple website might have looked like from the pre-Internet days. The farther back you go, the more fun it is, check out the “See Our Ads in Byte Magazine” button and a photo of Jobs & Woz that looks snapped in the founding garage. For a longer trip down pseudo-memory lane, check out his slideshow here. Thanks to reader Thomas for the tip! Flickr user raneko (who is no stranger to regular Cult readers) has just uploaded a bunch of fantastic photos of Apple mice through the ages. 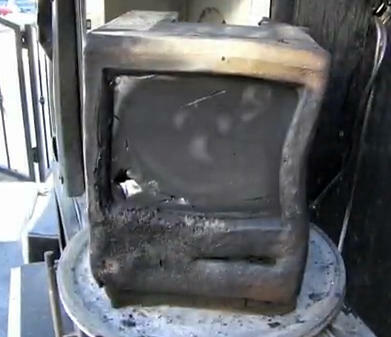 This is a hard one to watch: a 1984 Mac 512K meets its end in an industrial microwave oven. Watch as it goes up in flames — then witness the after effects of the burning on the keyboard, screen. It’s the work of Dovetastic, aka Kenny Irwin, who has been zapping everything from 1960s telephones to gas masks in the microwave on YouTube since February 2006. Ouch. After it comes out of the oven, hours later, it keeps sizzling! Need a stiff drink to get that happy face in charred plastic out from under my eyelids before it haunts me forever. The beloved Dogcow Moof! t-shirt from RedLightRunner is now a rarity. It’s always a little dicey doing a “Best of” Apple t-shirts post because the really, truly best Apple t-shirts have always been the limited edition, short-run t-shirts that Apple prints up for employees and other associates, the ones Guy Kawasaki wrote about in his 1990 book, “The Macintosh Way.” In it he draws a flow chart depicting Apple’s process for making great products and the first step is: Order t-shirt. In fact, there’s a whole book on the subject, by Gordon Thygeson – “Apple T-Shirts: A Yearbook of History at Apple Computer” – with 1000s of pictures of such shirts from over the years. However, for those of us not lucky enough to get our bods into one of these rare and memorable pieces of Apple attire, there are a number of outlets in the US and the UK (and probably elsewhere as well) where you can pick up some cool threads and show the world where your allegiances lie. Hit the jump for a gallery of 10 we think are worth checking out. 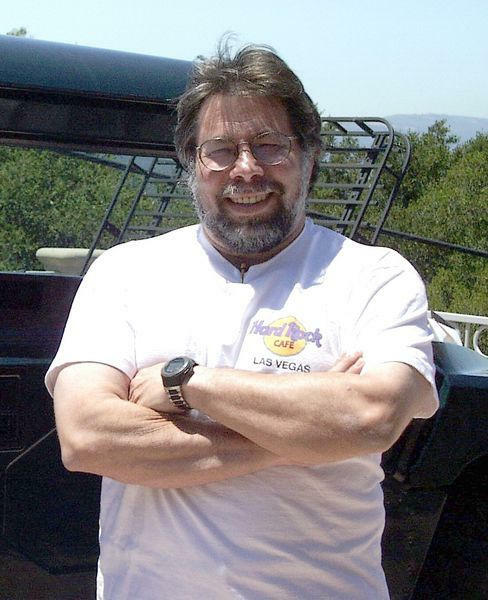 Engineer and programmer Steve Capps, who worked on Lisa, the Finder and Macintosh system utilities, talks about his work on the original Macintosh team with the guys at RetroMac Cast in a two-part podcast (episodes 115 and 116). Capps got started by automating a library in college, then went to do the same at Xerox before landing at Apple in 1981. 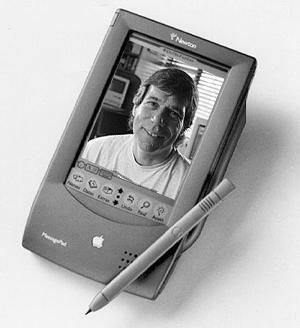 He was chosen to work for the Mac team because he had “the right chops at the right time.” Capps was working on a printer drive for the Lisa team, when Steve Jobs lost interest in Lisa and put the steam behind the Mac, calling Capps over. “Great to talk about the old glory days,” Capps, who went on to work on Internet Explorer and MSN Explorer, said. 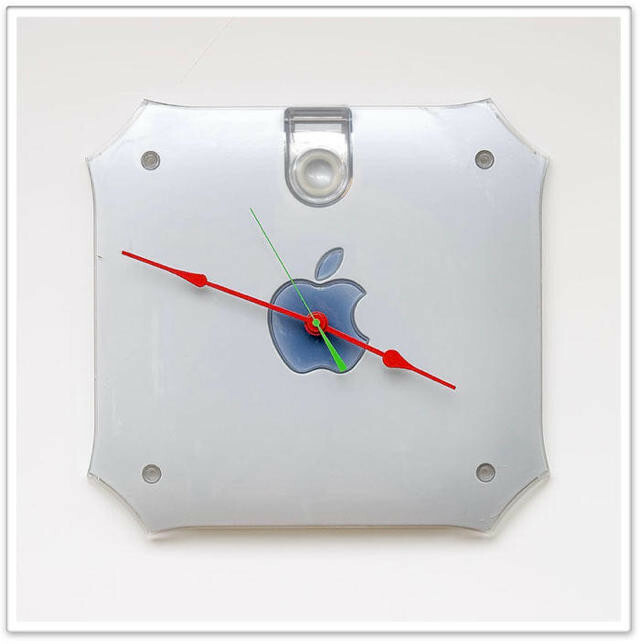 Can you think of another company whose outdated and obsolete products get repurposed as art pieces even a fraction as often as do those from Apple? 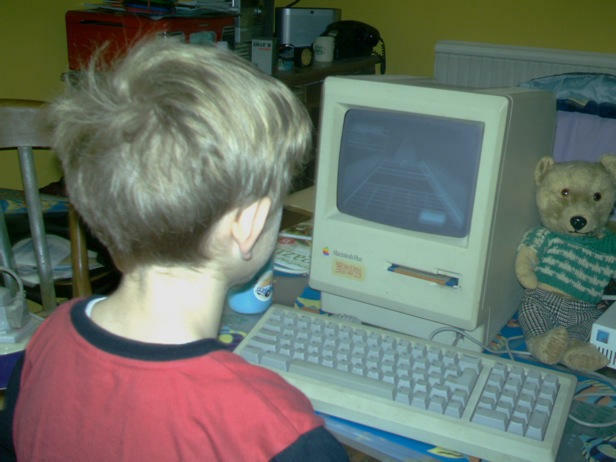 How about a late 20th century PowerMac G4, which, as a 10 year-old desktop might possibly still be good enough to run your elementary school children’s games and learning software, but for all practical purposes is probably better suited as the inspiration for a wall clock to remind you, time after time, how gear Apple cool is. At a mere $60, these may not last long and you should look into turning your own dusty G4 into a DIY project. 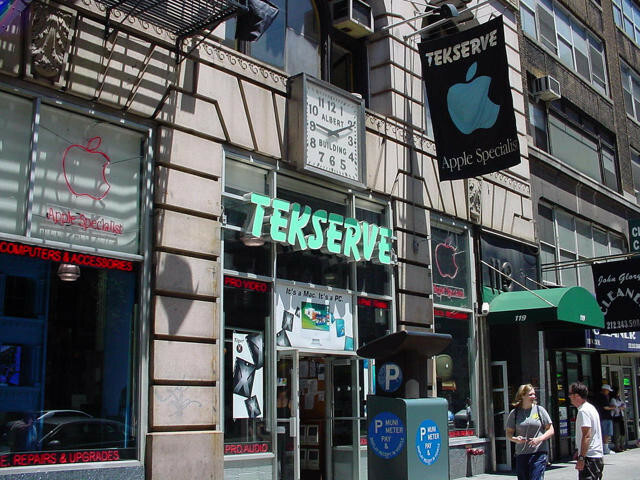 The TekServe store in Manhattan has been celebrating 25 Years of Mac this week with what it calls “a petting zoo” of Macs at the largest independent Apple shop in the US. The store’s exhibit includes an original Macintosh 128k signed by Steve Wozniak himself, a Lisa, the original Mac Portable, a Newton, a NeXT cube, the G4 Cube, various Powerbooks, the eMate, the legendarily laughable 20th Anniversary Mac, and the first iPod. If you happen to be in the New York area and want to get a first-hand look at the Mac’s evolution, be sure to stop by TekServe by Sunday, the exhibit’s final day. In the last of our stories from owners of original and classic era Macs, we talk to Nigel Curson. His Mac Plus has seen action as a desktop publishing workhorse, early internet client, and now toy for kids. And it’s still going strong. 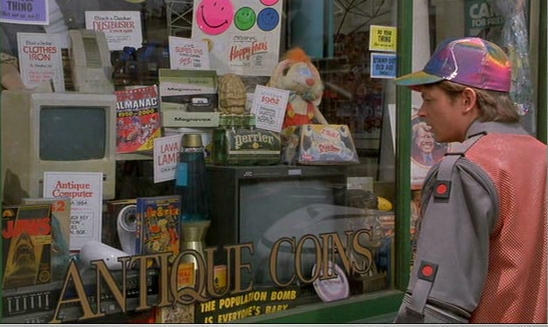 Here’s an early Mac movie product placement. In the opening minutes of 1989’s “Back to the Future II,” Marty McFly lands in 2015, where hover cars loom, “Jaws 19” in 3D plays in movie theaters and folks sport layered outfits that only a daltonic could love. In an antiques store, Michael J. Fox does a double-take over a “vintage” Mac sitting next to other 80s relics like a Dust Buster and a bottle of Perrier. 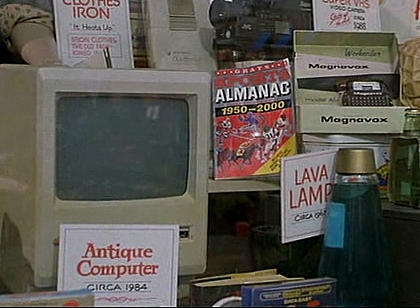 Found on the excellent Starring the Computer, where James Carter has compiled a few other early Mac movie sightings including “Manhattan Project” and “Star Trek IV: The Voyage Home,” both from 1986. Anyone remember Mac movie appearances before 1986?